Get the right fit by measuring yourself and following our detailed clothing size charts! Our size and fit specialists ensure that every garment corresponds to our size chart. You can be sure your favourite clothes will fit magnificently, whether they are shoes, t-shirts, bras or jeans. Don’t buy the wrong size; measuring yourself is easy, and will save you the hassle of having to exchange an ill-fitting item. When measuring yourself, keep the tape firm, but not tight. Measure over undergarments for more accurate measurements. If you don’t have a measuring tape, use a piece of string and measure it using a ruler. Ask a friend to help you take the measurements, or head to a tailor. Measuring yourself will give you a more accurate idea of your size. Once you have determined your body measurement, it’s a good idea to consider your body shape and the styles and cuts that will suit both your body measurements and shape. 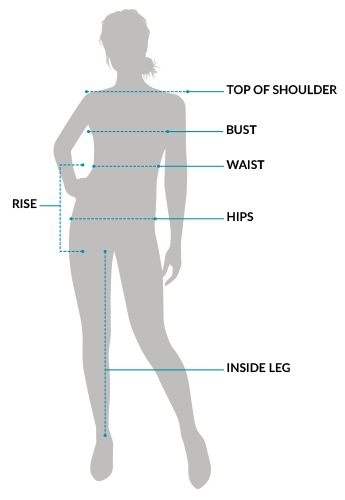 See our Find your Body Shape Guide for more information. TOP OF SHOULDER: Measuring the width of your shoulders can help you determine your body shape. Wider shoulders may signify an Inverted Triangle body shape, while narrow shoulders might make you a Diamond or Pear shape. You may also be able to find a better fit for your t-shirts and shirts if you know your shoulder width. Simply measure the points on your shoulders that sit above your armpits and measure end to end with a straight tape measure. To measure for dress length run the tape measure from the end of your shoulder to where the hem will sit. BUST: Measure around the fullest part of your bust. This is a key measure for tops and dresses. It’s important not to tighten the measuring tape too much, and to make sure it sits horizontally across your body. WAIST:Measure around the natural waistline – the narrowest part of your waist – keeping the tape comfortably loose. This is an important measurement for high-waist skirts and fitted tops. The size of your waist, hips and bust may give you an idea of your body shape. An Hourglass body shape for instance, will have a small waist and bigger bust and hips. HIPS:Measure around the fullest part of the hips. This is different for everyone; if you are unsure, take several measurements in this region and use the biggest measurement. This measurement is important for trousers, jeans, fitted skirts, and dresses. INSIDE LEG:Run the tape measure from the top of the inside leg down to the ankle bone to determine the length of your legs. This is helpful for figuring out whether you are suited to petite or tall-style pants. RISE:To determine the rise on a pair of jeans, measure the distance from the crotch following the front seam to the button at the waist. Low-rise is around 23cm, mid-rise is around 25cm and high-rise is around 27cm. Finding the right size for your shape shouldn’t be a hassle. Once you have measured yourself, compare the results with the bust, waist and hip measurements in the appropriate women’s clothing size chart. We’ve included both the numeric sizes, and Alpha sizes, so you can get the right fit, every time. Don’t risk looking frumpy in a dress that’s too big, or stuffed into a pair of pants that are too small. Get the perfect size for you by following our simple size chart. When selecting your size, fit to the widest part of your body and choose the size closest to the widest measurement.